AHEAD of this week’s Parliamentary debate on badger culling, Natalie Bennett spent time on Friday discussing the green alternative with local farmer Huw Rowlands. Scientists and environmentalists have described current government policy as “badly-planned, poorly executed and inhumane” as well as cruel and expensive, with costs of pilot schemes in Gloucestershire and Somerset estimated at an extraordinary £2 500 per badger killed. Yet—incredibly—Environment Secretary Owen Paterson, who famously blamed problems with the pilot cull on the badgers ‘moving the goalposts’, plans to ignore expert advice and push ahead with large scale culling. When Ms Bennett—an agricultural science graduate—was elected leader of the Green Party last year, journalists were amused at the notion that she was the only national party leader who knows how to shear a sheep. She also clearly understands Cheshire farmers’ concerns about the spread of bovine TB, but insists that badger culling is not a scientifically credible approach to controlling the disease. “I was delighted to visit The Grange Farm in Mickle Trafford and to discuss the green alternative to badger culling with Mr Rowlands” said Ms Bennett, “The Green Party listens to farmers’ concerns and to expert opinion; our policy is based on both. Current government policy is based ignorance and disregard of scientific advice. The Grange Farm is well known locally as a beacon of sustainable farming practice and the Rowlands’ have been working with the Cheshire Wildlife Trust to trap and vaccinate badgers. Under Ms Bennett’s leadership, the Green Party have long argued in favour of this approach, together with tighter controls on the transport of cattle to slaughterhouses and outbreeding of dairy cows to reintroduce hybrid vigour into the herd, with consequent disease-resistance improvements. 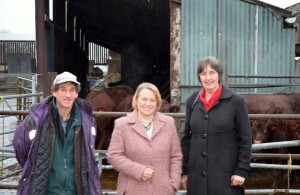 Local Green Party leader, Jackie Turvey Tait (pictured above with Natalie Bennett and Huw Rowlands) said: “Culling has been an embarrassing failure for the government and may actually have made the situation worse for farmers in the pilot regions. We urge people across Cheshire to write to Stephen Mosley MP—who has previously expressed support for badger culling—asking him to change his view. This entry was posted in Campaigns, National News and tagged ‘irrational’ government policy, ‘irrational’ government policy on bovine TB, bovine TB, Environment Secretary Owen Paterson, Green Party Leader, Huw Rowlands, Jackie Turvey Tait, Mickle Trafford, Natalie Bennett, Stephen Mosley MP, The Grange Farm in Mickle Trafford by tamesidegreens. Bookmark the permalink.